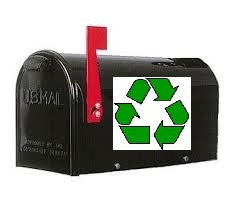 Approximately 90-95% of my mail goes directly into the recycling anyway. Why not eliminate the middleman, i.e. me? Most of our bills and personal correspondence are of the electronic variety. Those electrons get recycled already. In fact, this post is written with 75% post-consumer electrons! The rest of the junk (and junk it is) goes directly to the recycling. Do not pass my eyes, do not spend $200. Let Verizon and Comcast slug it out on TV. You’d save on your cable bill. Don’t even get me started on credit card applications. Catalogs have always been a bane of mine. Before I saw the light, I would always peruse them and eventually find something I needed. I didn’t know I needed it till I laid my eyes on the psychologically designed photo and read the tempting text describing it. Since I got a grip and started pitching those demons without a first glance, I’ve probably saved a fortune. It’s good to pray, “Lead me not into temptation,” but sometimes you are your own answer to prayer. Toss that temptation! This entry was posted in General and tagged catalog, comcast, credit card, mailbox, recycle, temptation, verizon. Bookmark the permalink. Yes, indeed. Toss that temptation! So true! Talk about a waste of paper! Especially when you are cleaning the clutter for the Thanksgiving Day celebration!